Aww, yeah, baby. 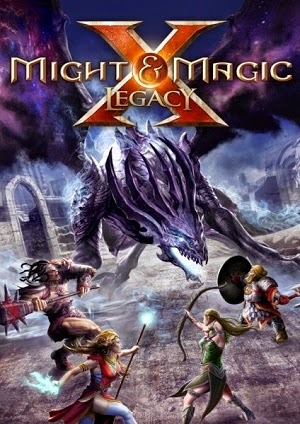 Might & Magic. I was first introduced to this series back in the early 90s, with Might & Magic 4: Clouds of Xeen. To say it blew my young mind is an understatement. It was like nothing I'd experienced before. While I would say Bard's Tale 3 was, objectively, a better game, Might & Magic was far prettier and more immersive, even though 4 came out a scant four years after. It was just bigger, more immersive, and generally more impressive. 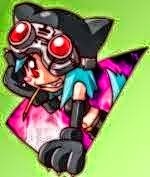 It also introduced me to one of gaming's greatest "joys": waiting for a repeatedly delayed sequel. That being said, Might & Magic 5: Darkside of Xeen more than lived up to the hype, even without getting into the whole "World of Xeen" post-game quest. This was quality stuff. Despite how much I liked it, I kind of dropped out of computer gaming for awhile afterwards, and never had much to do with the follow-ups (6-9), nor the Heroes of Might & Magic series, nor the Warriors, Legends, and Ring-Tailed Lemurs of Might & Magic. Looking back at them, I might enjoy 6-9 (well, probably not 9), but I was never terribly interested in the other series. To me, Might & Magic will always be a first-person, grid-based hydra. So, my brother loaned me this book and I read it. Yeah, an actual dead-tree book. It's been awhile. I hadn't realized how spoiled I'd gotten with my Nook's built-in light. There was a bit of contorting to get sufficient light at work sometimes. Also, it's much harder to eat while reading a book than using a reader. Yes, yes, none of this is earth shattering news, but it's been so long since I read a paperback, I'd kind of forgotten. Also, I needed a bit of filler as this won't be a particularly long review. 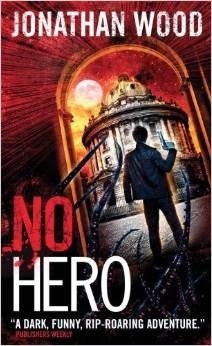 Anyway, No Hero tells the story of Oxford police officer Arthur Wallace who stumbles into the underground realm of MI-37, and their quest to prevent Evil Horrors From Beyond Space And Time from Destroying All Reality As We Know It. He meets a colorful collection of eccentric coworkers, a love interest (two, I suppose), some double crosses, some Chessmaster Gambits and various and sundry things that you'd expect in this kind of book. It all wraps up with a Big Damn Climax, and a happily ever after that leads to the sequel hook for the next book (because all books must now be trilogies, if not longer). UPDATE: They've decided that Quinn will appoint a replacement for the remainder of Topinka's current term while Rauner will appoint a replacement for the term she recently won. Quinn wants the legislature to have a special election for the seat in 2016, but he can't force it and it probably won't happen. Today, Judy Baar Topinka died. She had a long career and was quite popular across the state. She was also the sort to tell it like it is and not mince words. She will certainly be missed. She will also likely have lots of ink used to compare her to Jane Byrne who also recently died. Of course, since I'm me, I'm not going to focus on any of that. I'm going to focus on my (admittedly unqualified) opinions about the issues the timing of her death have left behind. We're currently in the lame duck session. For those not familiar, it's the vast limbo between election day (November 4th) and inauguration day (January 20th). The late inauguration is a holdover from Ye Olden Dayes when it took time to gather information and to figure out what was going on and to travel across the state and/or country. When you had to go by horse, this made sense. However, we're now in a world where, nine times out of ten, we know the winner of any given election within hours of the polls closing. Some folks will even make (shockingly accurate) predictions within minutes. There's a whole cottage industry built around seeing who can predict the fastest (personally, I go with the Ace of Spades HQ Decision Desk which has been eerily good). Regardless, this politically ancient process leaves us with almost three months where people who know they are out of a job still have power. If you've been voted out, you no longer need to worry about the ramifications of your actions. It's not like you can be voted out; that already happened! Imagine being at work and being told, "Hey, in three months you're going to be fired. Keep doing your job until then." What kind of work would you do? How motivated would you be? How many boxes of pens would you steal? Now imagine that you were partially responsible for a multi-billion dollar budget. It's insanity. I've mentioned before my love of "blue collar dudes in space". 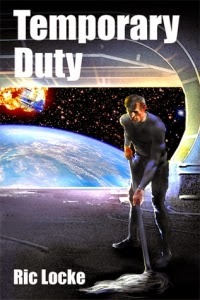 Temporary Duty falls into a fraternal-twin genre, "military grunts in space". As you can tell by the cover, this is not a glamorous duty. And I love it. A little backstory is required here, I think. I found out about this book because I follow the blog of the person who did the cover image. Ric Locke self published the novel and was working on a sequel while he was in the process of dying of lung cancer. Part of the money from the novel went towards getting him oxygen tanks and such. I gladly bought a copy and then sat on the book for awhile (as I'm wont to do, apparently). By the time I got around to reading the book, I found out that Locke had already died. It was a weird experience, and I mentioned it on Facebook at the time. Anyway, all that aside, the book is well worth tracking down on the eReader of your choice. Would You Like a Haunting With That? Not to be confused with the movies House on Haunted Hill (1959) or House on Haunted Hill (1999). However, if you want to watch a film version, there is The Haunting (1963) and The Haunting (1999). Now we just need someone to make a movie called House Haunting Hill and we'll never know what the hell is going on. My first exposure to this story was, sadly, the 1999 version of the Haunting. It has about as much in common with the original story as the House on Haunted Hill does; which is to say that both involve a) people and b) a haunted house. So, my short review of 1999's the Haunting is: don't bother. That being said, the 1959 House on Haunted Hill is a perfectly serviceable haunted house picture; I'd recommend it. But enough yammering about confusingly named properties that are all to similar to each other in title if not in content. We're here to talk about Shirley Jackson's book! Briefly? It's fantastic.